Again greeted by Elaina Ryan there was an opening presentation of two of CBI's incentives for this year (along with other enlightening information.) The Bold Girls initiative has been running all year. 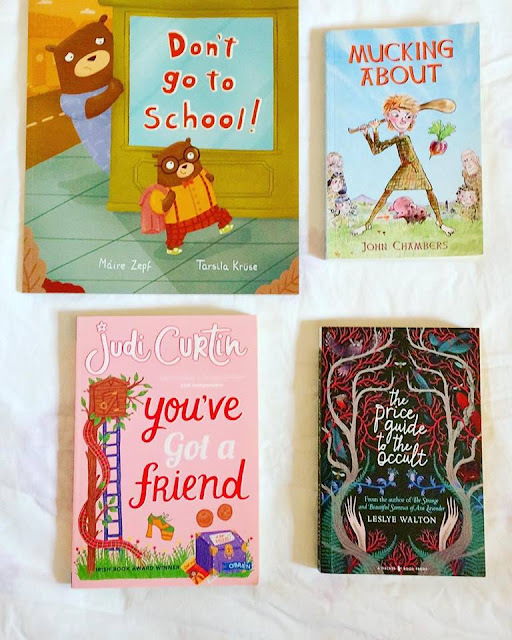 For the centenary of womens' suffrage in Ireland, Bold Girls has aimed to present and inspire girls and young women and celebrate strong, confident, intelligent, forward-thinking women and girls through childrens' books, giving them high-visibility alongside their male counterparts in literature. 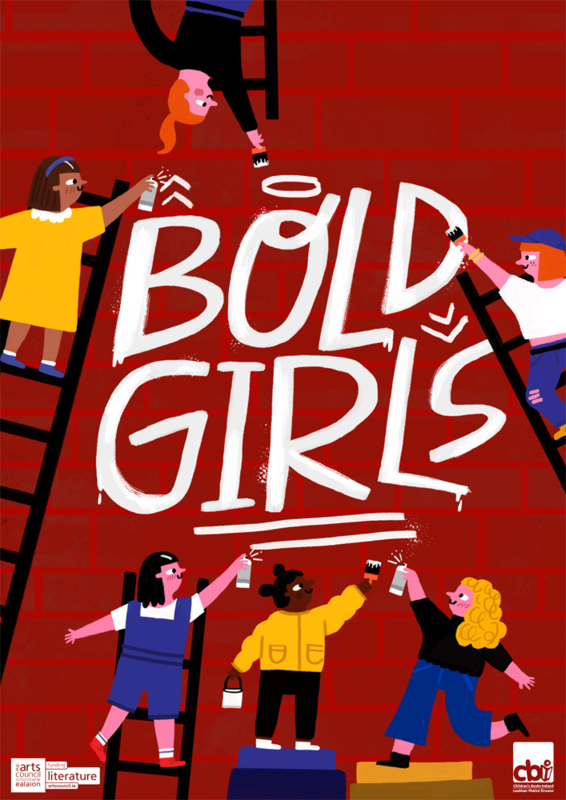 If you haven't picked up the Bold Girls Guide yet, it is available through CBI and at many bookshops in Ireland. 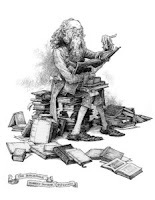 With hundreds of book recommendations for all ages, it is indispensable. The Sunday sessions began with something truly special; Laureates in Conversation. 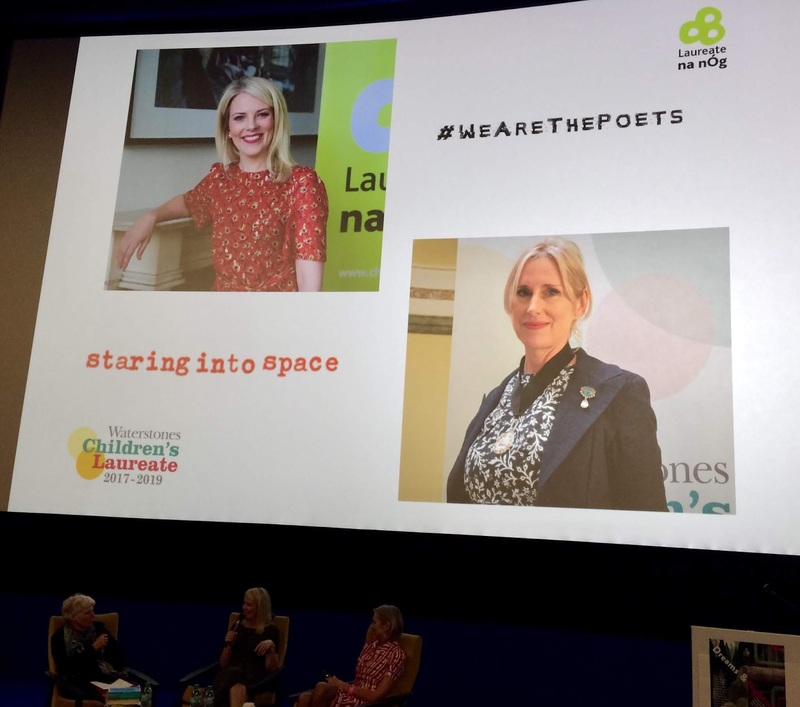 Sarah Crossan, our new Laureate na nÓG and 2017-2019 Waterstones Childrens Laureate, Lauren Child were in conversation with Julia Eccleshare about their separate and joint roles as childrens' laureates of Ireland and the UK. Sarah Crossan writes amazing verse novels for teens and young adults that should be read by everyone. The Weight of Water; Apple and Rain; One; We Come Apart (with Brian Conaghan) and her latest, Moonrise are evocative and emotive explorations of the 'feeling' world of young people and their lives. 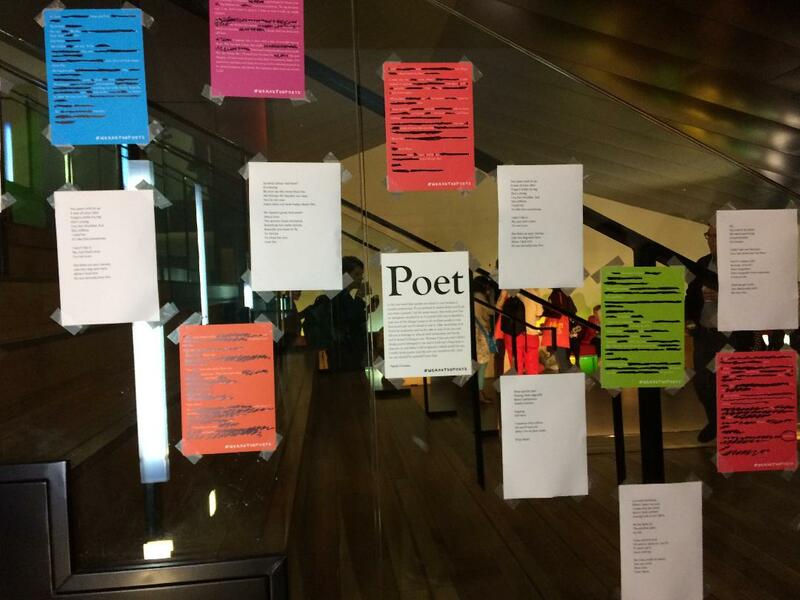 Her project is #WeAreThePoets and is aimed at encouraging young people to use poetry and the way it makes them FEEL, learn about it and write their own in a way the expresses their own voices. She has a particular interest in working with marginalised communities. 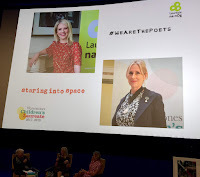 Lauren Child has chosen #Staringintospace as her theme. She believes that children desperately need the time to daydream, to stare into space, to be bored(!) in order to develop their personal curiosity and creative voice. She wants to encourage creativity; inside and outside of school, in adults, in children....everyone, everywhere. 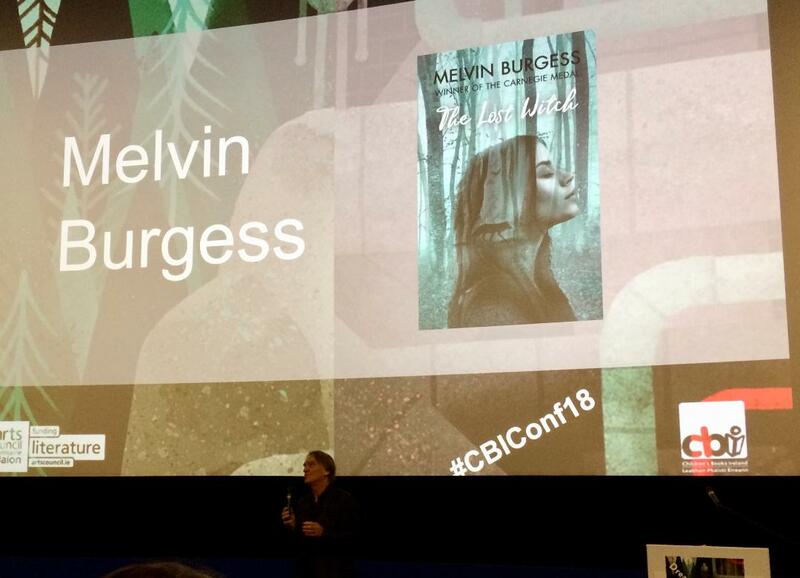 Melvin Burgess has been writing for teenagers and young adults; bringing their dreams and nightmares to the printed page for many years. He brilliantly portrays the dark side of life with a gripping tenacity that has enthralled and continues to do so. His latest book, The Lost Witch explores a moment of time of awakening in a young womans' life; of growing up and not knowing who you are and then suddenly, and quite dramatically discovering; of obtaining agency in your own life. It is clearly not a comfortable tale, but it is a powerful one. He has packed a lot into this novel; the hunt, mythology, misunderstanding and a clear and present danger with incredible world-building. There are leanings towards a story of 'grooming' and cause and effect of such. The consequences of the central characters actions, even though she has been heavily influenced, bring about a set of horrific circumstances and there are questions of responsibility and guilt. Everything you do has a consequence. Burgess is a real weaver of stories. 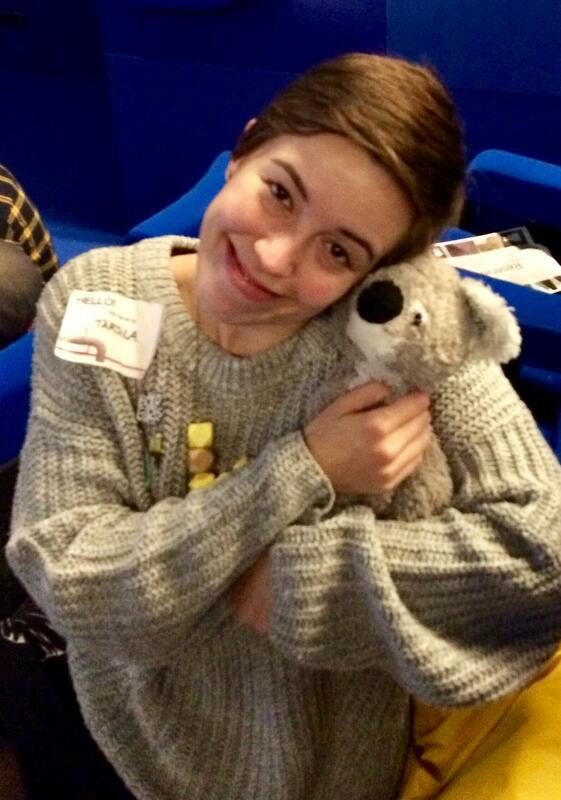 Patrice Lawrence was an astounding addition to this years' conference. Her talk was entitled 'Between the Cradle and the Reaper' (taken from a beloved poem.) She herself came from a very diverse, mixed race, mixed social background and expresses these aspects of herself in her writing with humour, depth and eloquence. Patrice spoke about how, growing up, she didn't really know what "normal" was, and she still really doesn't. But she gives her characters a strong and true voice and expression in all her writing; OrangeBoy, Indigo Donut her contribution in the anthology Change Is Going To Come. Her next novel sounds incredible. It is the story of two teenagers emerging from a very tight, closed Christian community into the "normal" social structure and how you negotiate the nightmares that come with the freedom. 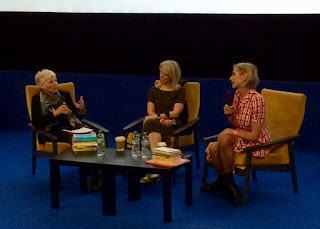 Just a fascinating speaker; I could have listened to her for hours. 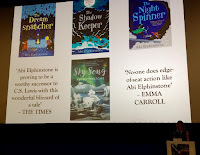 Abi Elphinstone talked about how, especially in childrens' books, light and dark are inextricably linked. And the light is all the richer for having stumbled through the dark to find it. Her books are certainly testament to that philosophy. 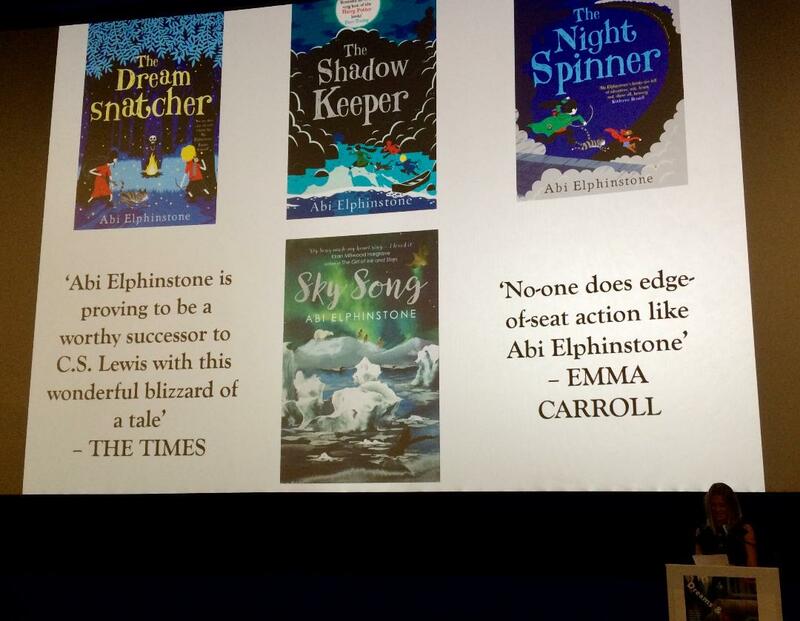 The Dreamsnatcher trilogy and Sky Song present us with some engaging central female characters, some truly dark and frightening experiences met with tenacity and agency, the challenge of what it really means to 'belong' and the fact that not all boys need to be warriors to be heroes. And central characters are those who are willing to make mistakes; they aren't afraid to get it wrong to get where they need to be. There is always a strong element of hope in her books, for if we carry hope, the light will always undo the dark. These amazing fantasy books are for 9+ years and each tells a great story that needs to be heard and felt and lived. 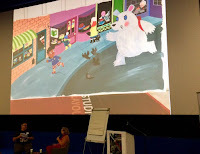 We finished the day (and sadly the conference) with Steve Lenton, who grew up in a family business that was the sole manufacturer of 'pompoms' creatures, so was constantly surrounded by 'characters'. Inspired by these and cartoons he watched as a child, he found his way into animation and art direction of animated commercials and then...book illustration. The Shifty McGifty picture books (written by Tracey Corderoy) are a delight, with mad-cap action and crazy characters. But perhaps one of the biggest delights of Steves' work are his illustrations for the now classic One Hundred and One Dalamations. 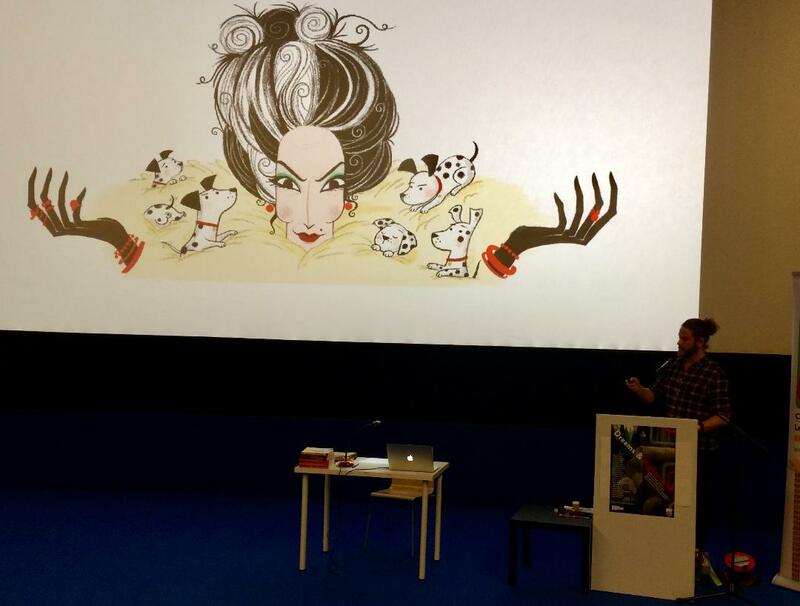 (We had a little drawing competition in which Steve showed us how to draw the perfect Cruella DeVille.) Fun, fantastic end-of-conference fare. Before I go...I did say what a brilliant time I had catching up with everyone and meeting new people, making new friends. Well, I'm not the only one. 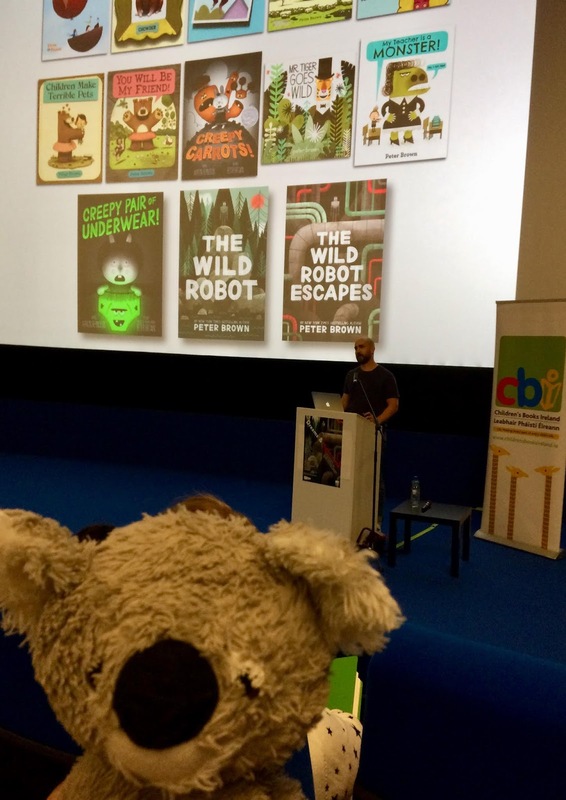 LB Koala attended his 2nd CBI Conference (you've probably noticed him photo-bombing in some of the pictures.) He also loves to meet new people...especially those authors/illustrators of whom he is a huge fan. 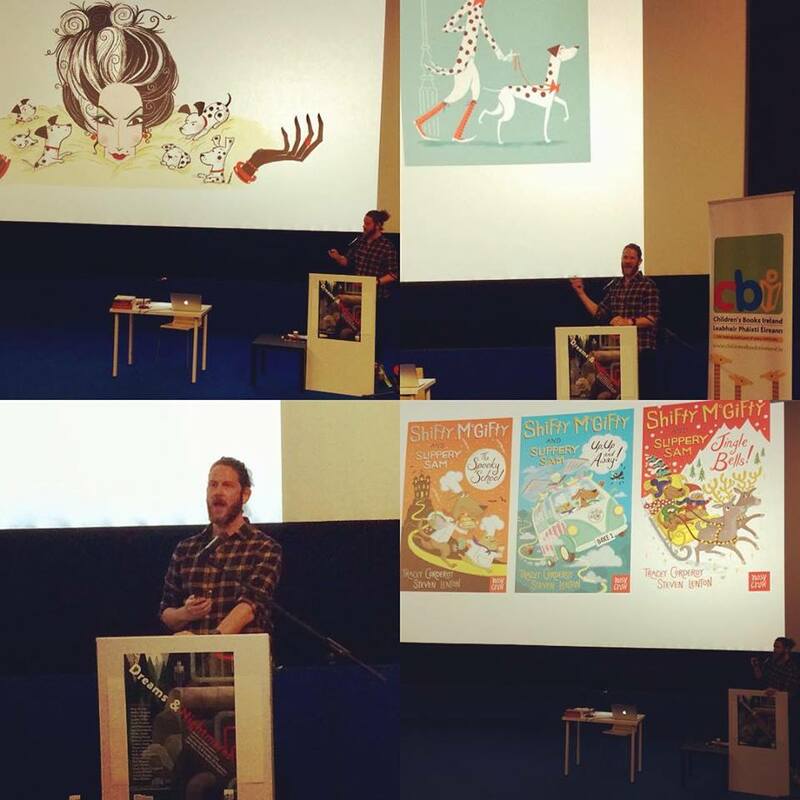 The highlight of my year; of many years now, in fact; is the Childrens' Books Ireland conference. 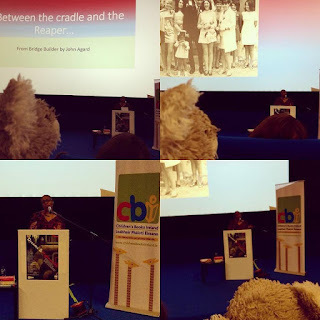 It is a chance to catch up with friends and colleagues, meet many new kidslit folk and glean more knowledge about what is being published, what children want to read at every age and gain more focus and enthusiasm. 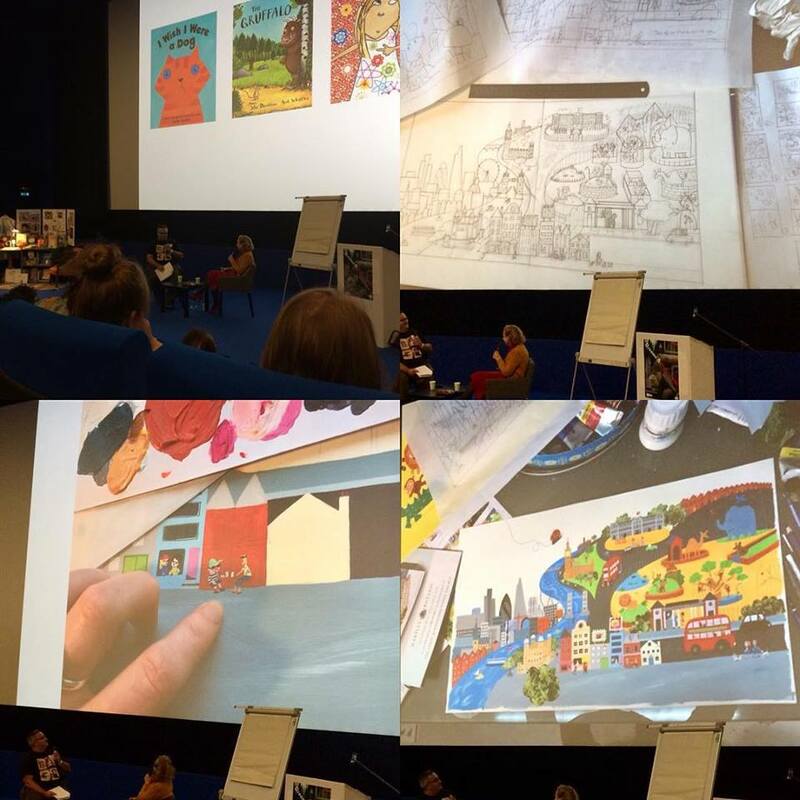 It is so incredibly wonderful to be surrounded by people who understand your passion and energy for childrens' literature. All of us always go home with a greater amount of knowledge and a hefty amount of childrens' books to read. Frankly, it's just so much fun!!! 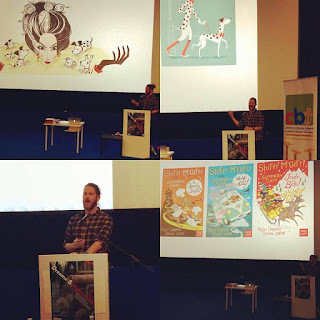 I would recommend attending if you have an interest in childrens' literature; authors, illustrators, publishers, teachers, kids booksellers...really anyone. This year, for two days we were treated to 'Dreams and Nightmares' (as the theme of this years' conference) from some of the most exciting authors and illustrators working in childrens' books. It cast a magical spell over us all. I'm going to break this into two blog posts for the sake of clarity and....well, it will be a bit lengthy otherwise. The day opened, as they all do, with Elaina Ryan welcoming all the delegates and speakers and letting us know, in a concise but still in depth manner, what CBI has been up to over the last year, and there was always a hint of things to come. 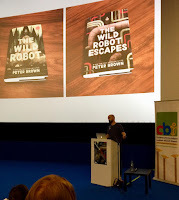 Then, we jumped right in with Peter Brown. 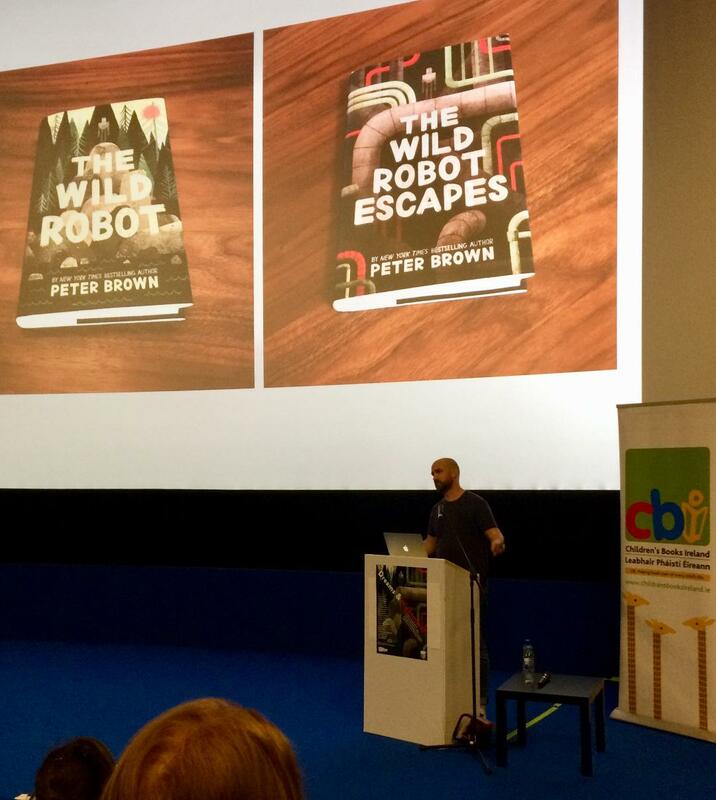 Peter's work graced the cover of the conference brochure this year, with an illustration from his book, The Wild Robot and The Wild Robot Escapes. Thematically, his books have a recurrence of the 'earnest outsider'; one who is looking for understanding, belonging and companionship in a world that can seem very big, very scary and very lonely. All of this he accomplishes with great humour, warmth and a sense of deep joy. His talk on the dark and light to be found in all of his books included a wonderful, brief journey into his writing past, escapes along his journey and some insightful glimpses into how he works to develop his story and his own artistic voice. Story-mapping and illustrative storyboarding lead to books with short chapters, each ending with a cliff-hanger; which are excellent for encouraging young readers who may not be quite so confident in their skills at the moment. 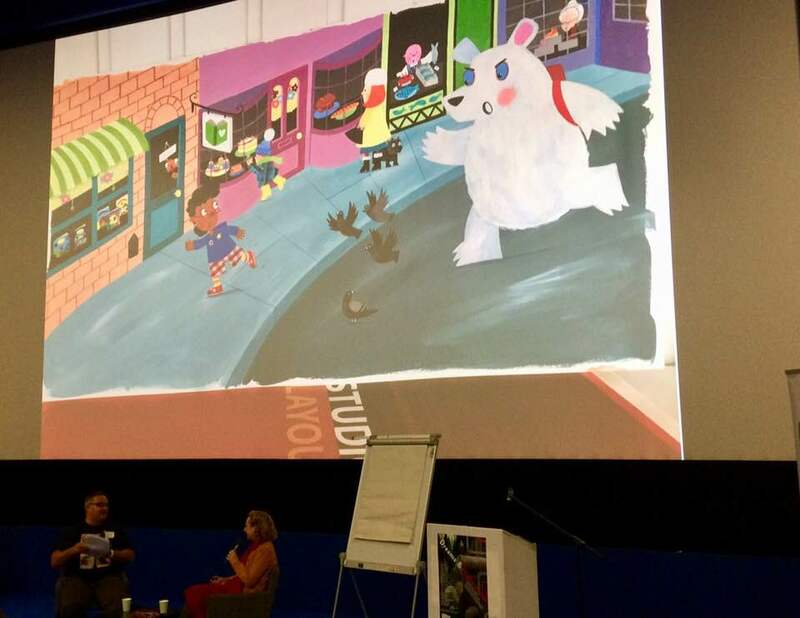 MG Leonard (author of the Beetle Boy series) was in conversation with Dave Rudden; and a lively and exciting conversation it was! Her books are all based on factual accuracy rather than a fantasy world; exploring and finding joy in the natural environment and learning to find a method with which to deal with phobias. All the beetles in her stories are biologically accurate, and so cannot do anything outside of the possibilities for a beetle. Wrapped up in all of this is a keen exploration of mental health issues and emotional well-being, something young people need to come to terms with quite early in our world today. 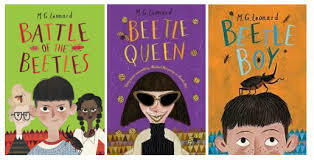 Add to this a thrilling adventure of a boy (Darkus) in search of his kidnapped father, a fashionista villainess with an alarming fascination with insects and hilariously depicted scenes of daring, exotic beetles and friendship and you have a truly captivating series that must be read. 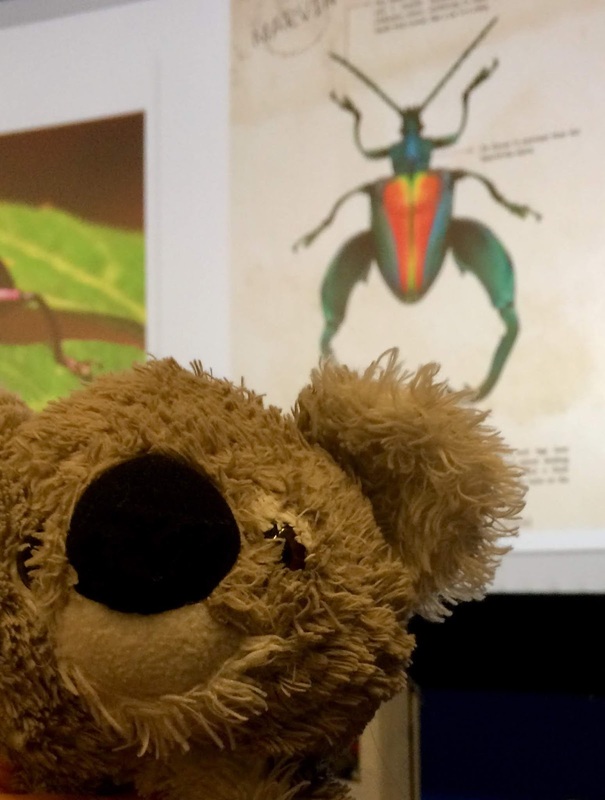 There's even a new Beetle Collector's Handbook available which not only gives the reader beetle 'facts', but relates these through a wonderful narrative voice in story-telling fashion. The New Voices session is always a welcome treat. This year, nine author/illustrators (only two of these worked together) presented their debut books, all published just this year. Each had a quick-fire five-minute speaking slot to present. 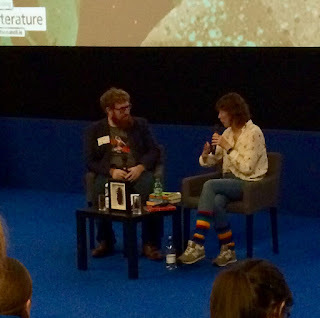 The presenters were: Tina Callaghan (Dark Wood, Dark Water; YA horror fiction, Poolbeg); Kelly McCaughrain (Flying Tips For Flightless Birds, Walker Books); Caoimhe Nic Lochlann (Scéalta le hlnsint don Ghealach, Cois Life); Cethan Leahy (Tuesdays Are Just As Bad, Mercier Press); Pádraig Kenny (Tin, Chicken House); Alsion Healy (How Billy Brown Saved the Queen, Little Island Books); Brendan O'Donoghue (Adventures in Philosophy; Storeis and Quests for Thinking Heroes, Gill); Aga Grandiwicz and Rob Maguire (Dr Hibernica Finch's Compelling Compendium of Irish Animals, Little Island Books) and Emma Quigley (Bank, Little Island Books). 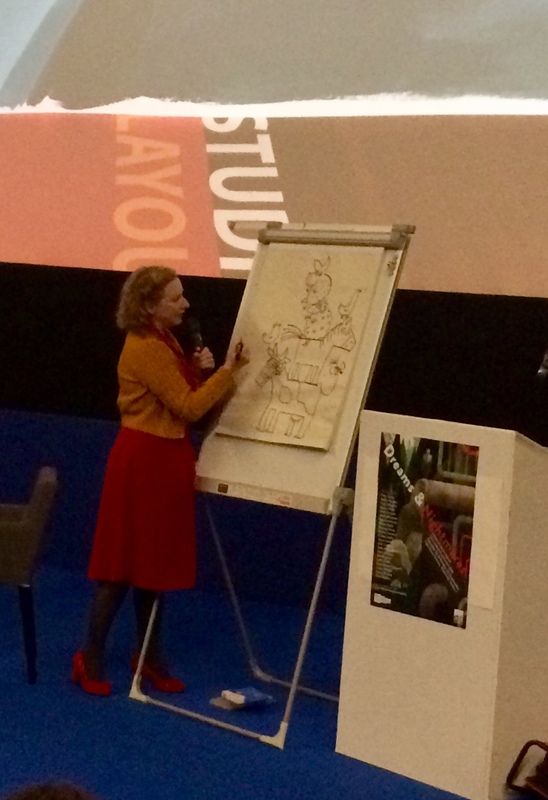 And she even did a bit of drawing for us while answering questions. 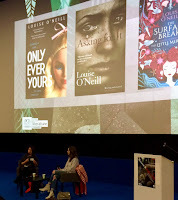 We ended our day with an insightful discussion; Sarah Moore Fitzgerald in conversation with Louise O'Neill. Louise is a pivotal young Irish author writing Young Adult fiction that is hard-hitting, evocative and speaks of realistic traumatic issues facing young women. Her previous books are Only Ever Yours and Asking For It. These books gave young women a different voice; the permission to have conversations they felt they couldn't have previously and to enter into a discourse that is about informing rather than concealing and protecting. And isn't informing a different method of protecting? Her latest is a bit of a departure; a re-appropriation of The Little Mermaid fairy tale by Hans Christian Andersen entitled The Surface Breaks (also for young adults). Thus ends day one of Dreams and Nightmares...next post; day two. 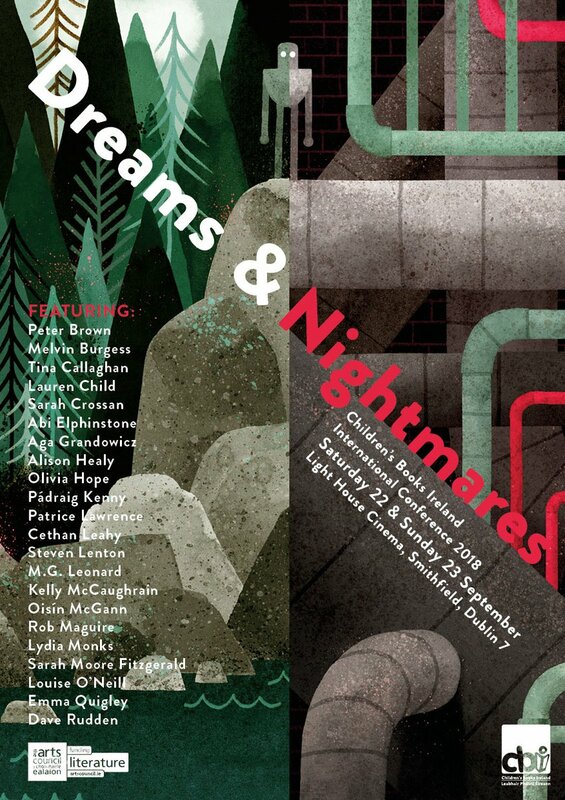 In just a few short days, Dreams and Nightmares, the Children's Books Ireland International Conference 2018 will arrive in Dublin. This is the highlight of the annual CBI calendar, and the highlight of my year, as well. The weekend long event celebrates the very best in childrens' books and gives us a moment to reflect on the importance and the impact that literature has on the lives of young people. 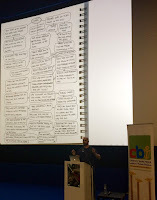 Each year, speakers are invited from all around Ireland and the world to give us a taste of what's happening, what's new and what we need to do to further promote, not just literacy, but the joy and wonder of childrens' books. There is so much information to take in; so many aspects of childrens' literature to be considered. I always arrive back home rejuvenate, re-energised and with a new reading list as long as my arm. 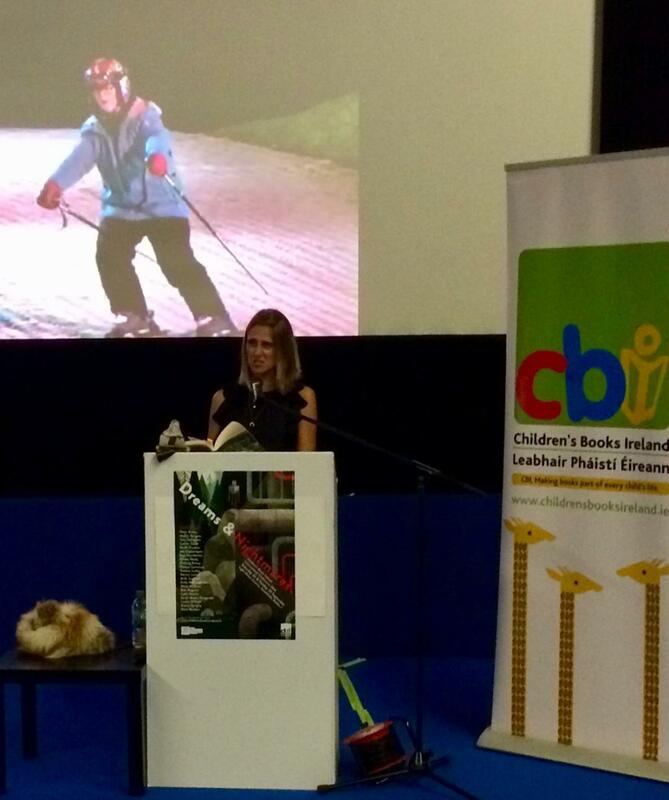 This years' speakers include M G Leonard, Abi Elphinstone, Melvin Burgess, Oisin McGann, Patrice Lawrence, Kelly MCaughrain, Lydia Monks, two childrens' laureates (Sarah Crossan and Lauren Child! )...well, you can see the list above. Some familiar, some new...all absolutely brilliant. I am delighted (beyond ridiculousness) to be attending this year and will post all about it next week. 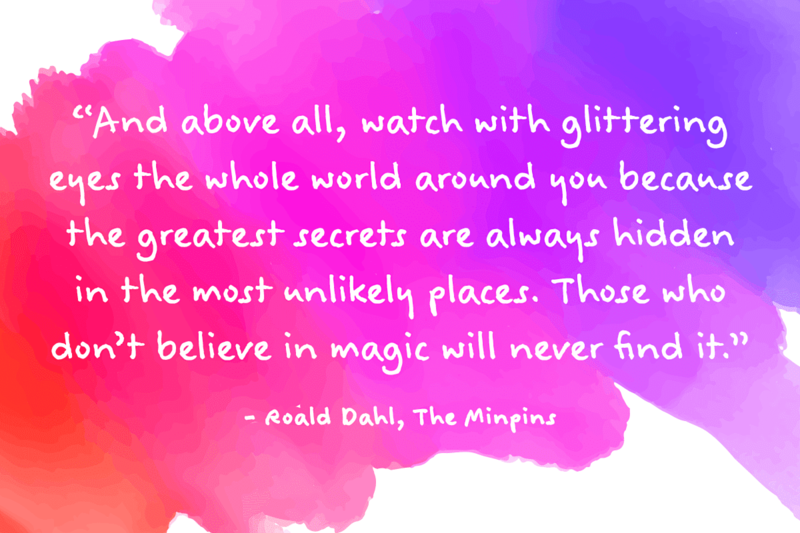 Happy Roald Dahl Day 2018! 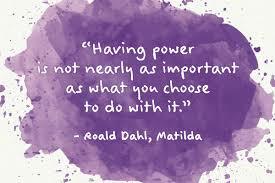 HAPPY ROALD DAHL DAY TO EVERYONE! 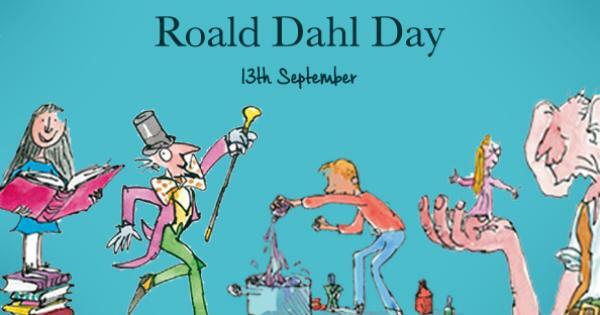 Each year, the 13th of September is marked in the childrens-book-loving-world as Roald Dahl Day, to celebrate one of the most beloved and imaginative storytellers of our times, if not ever. The date was chosen, of course, because its' Roald Dahls' birthday. Born in Llandalff, Wales in 1916 to Norwegian parents, he was named after Roald Amundsen, a Norwegian explorer who had been the first man to reach the South Pole. This set a high mark for him and while it may have been a heroic start, his early years were filled with tragedy due to the tragic deaths of both his older sister, Astri and his father. 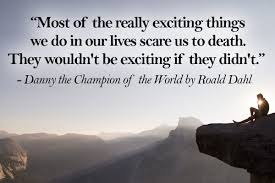 Roald was sent to boarding school, where his early memories inspired the childhood memoir Boy and, an event where students were offered to trial chocolate bars inspired his iconic book, Charlie and the Chocolate Factory. As a young man, he got bit by the 'travel bug', going to Canada and then to East Africa where he worked for an oil company. At 23, he joined the Royal Air Force. In 1940, he suffered severe injuries to his head, neck and back when his plane crashed in the Western Desert. These went on to plague him for the rest of his life. But after only 6 months of recuperation, he was back in action and took part in the Battle of Athens. Then, he was stationed in Washington, where he received and passed on information to MI6. In 1960, he helped to develop the Wade-Dahl-Till valve, which was prompted by a desire to alleviate the head injuries suffered by his son after an accident. In 1953, Roald married actress, Patricia Neal and they went on to have 5 children. They divorced after 30 years. He then married Felicity Crosland, who has continued Roald Dahls' legacy by establishing both Roald Dahls' Marvellous Children's Charity and The Roald Dahl Museum and Story Centre. 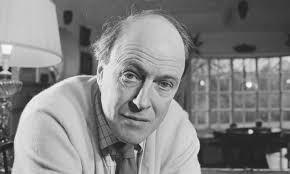 Roald Dahl died on 23 November 1990 of a rare form of cancer of the blood, myelodysplastic syndrome. According to his granddaughter, he was given 'a sort of Viking funeral' and was buried with his snooker cues, some very good burgundy, chocolates, HB pencils and a power saw. And then there are the books! So many marvellous books! James and the Giant Peach; Charlie and the Chocolate Factory, The Twits, Fantastic Mr Fox, Danny the Champion of the World, The BFG, Matilda... all of which fire the imagination and inspire children to be bold and clever. They are irreverent and sharp-witted and so very funny. But they all give us pause for thought. They view the adult actions in the world and the impact it has on a kids' life. Expressed with a quirky and rather dark sense of humour, each one is told from a unique childs' perspective, as if the author had never quite left the culture of children. I don't think he really did. Story-teller, screen-writer, aviator, inventor, spy...what a life! 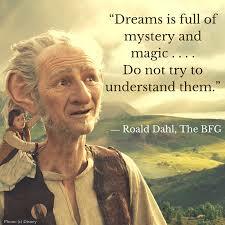 So...Roald Dahl Day was established to celebrate this intrepid story-teller and his vision. 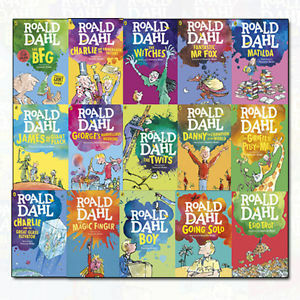 Each year, through the Roald Dahl website, you will find activities, games, podcasts, ideas and discussions. So it's up to you what you will do at home or in the classroom. 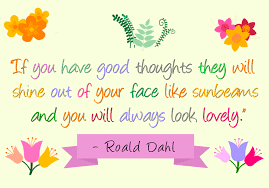 Chose your favourite Roald Dahl book to read; dress-up as your favourite character or create your own Roald Dahl-esque character. 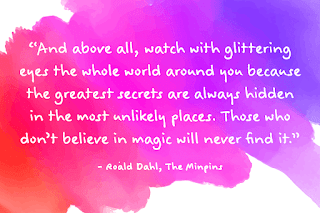 If you were in a Roald Dahl book, which one would it be and what would your name be? Do something special and raise money for Roald Dahls' Marvellous Childrens Charity, which helps fund specialist nurses and provide the best healthcare for seriously ill children and their families. And have fun doing it while promoting reading for the sheer joy of it. This year, the focus has been on James and the Giant Peach. This is the story of orphaned James, forced to live with his two horrible Aunts who are extremely cruel to him. But a talent for growing things leads him to a journey with giant insects on a luscious and huge peach and a way to escape his oppressive Aunts. Irreverent, bold and brassy, this is the perfect book to share with young readers as clever James takes charge of his situation and seizes the day! -Roald Dahl once had a tame magpie! -His favourite colour was yellow. -He once pretended to have appendicitis (when he was 9) so he could get sent home from boarding school...and it worked! -He was a terrible speller! But, he loved to play Scrabble. -Roald Dahl was 6 feet, 5 and 3/4 inches tall. That's nearly 2 metres! -One of his favourite hobbies was gardening. Roald Dahl grew gigantic onions! 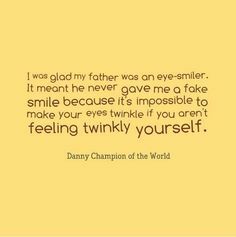 -His favourite book (that he wrote) was The BFG, but he was also particularly fond of Danny the Champion of the World. - The main-belt asteroid 6223 Dahl, discovered by Czech astronomer Antonín Mrkos, was named in his memory in 1996. -While he was known for being a bit grumpy and pernickedy with adults, he believed that no child should ever be left out. He would spend hours at book signings to make sure he spoke to every child and signed every childs' book. Here's the link to the Roald Dahl website, where you will find everything you need to know about the author, his books and the charitable work carried on in his name. This has been making the rounds on all the social media sites and with good reason. A Scottish granny is (trying to) read the wonderful picture book, The Wonky Donkey to hear little grandchild. There is such delight and joy in this video...what reading to children is all about! 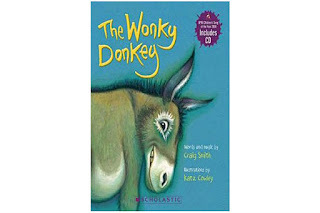 The Wonky Donkey is written by Craig Smith and illustrated by Katz Cowley (based on a song written by Smith in 2005.) 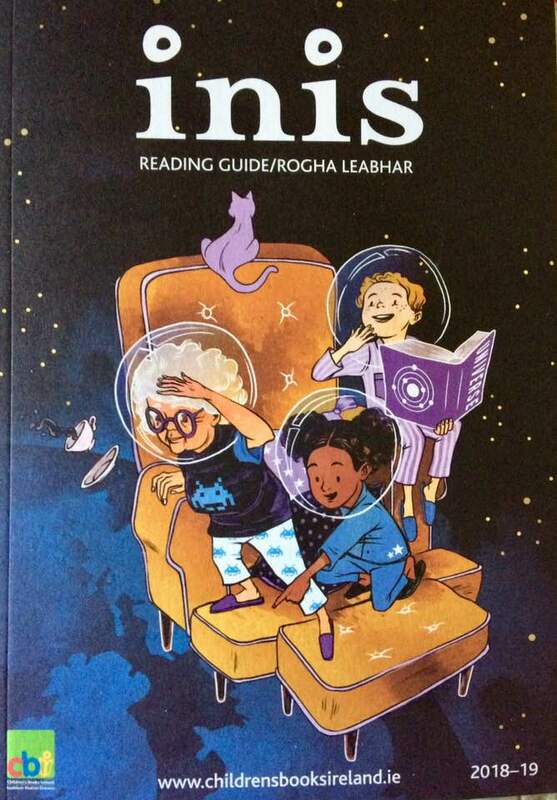 It is published by Scholastic. Roald Dahl is on its' way! 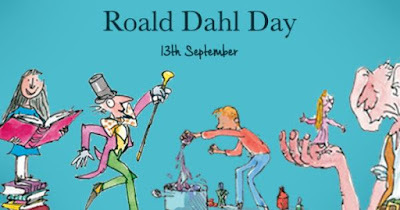 This Thursday, 13 September is Roald Dahl Day (because it's his actual birthday) As with every year, there are loads of events both online and around you, as well as party packs and activities on the website that you can share at home or in the classroom. All you have to do is register and get planning...FAST! 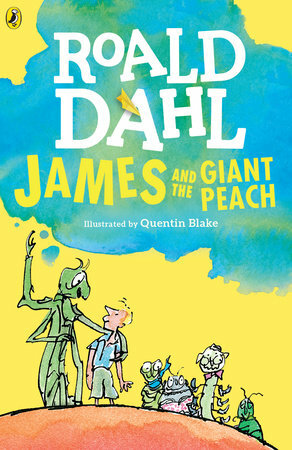 This year, the focus is on the wonderful book, James and the Giant Peach. In fact, this weekend is James and the Giant Weekend! To start yourselves this week, I'm going to recommend you grab a copy of James and the Giant Peach and spend the next few days enjoying it together. Log onto the website to discover the activities you can create and I'll be back on the 13th with a James and the Giant Peach blog, including some Roald Dahl trivia. See you then! September came quickly this year. Summer is over and we are all settling back into a rountine. Be sure to keep reading for fun as part of that! These are my favourites for the month. 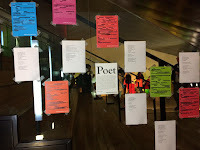 All of these are newly published and are reviewed on the various review pages of this blog.